With summer a few weeks away everybody is looking for more fun in the sun - that means away from the TV. So the sales for connected devices tend to drop, and if you're on the market for a mini PC or TV box this could be a good time to check out the offers. The "Gearbest Cool TV Boxes and Alfwise X5 Mini PC Flash Sale" is certainly a good place to start on your quest - it has both Windows 10 Mini PC's and Android TV boxes of all shapes and sizes (and prices). Secondly, there's the "Beelink Brand TV Boxes for Home Cinema Flash Sale", which is a collection of interesting offers for Beelink devices. Last, but not least "Best Home Smart Device Brand Alfawise Flash Sale", which contains offers on several Alfawise TV boxes - and other interesting devices as well. Now there are dozens of offers to check out between those three campaigns, so you can make your own list with interesting devices - here's what caught my eye. 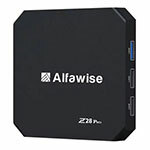 We're starting with Alfawise Z28 Pro, which has 3 versions (1G/8G, 2G/8G and 2G/16G) and comes with a better SoC (RK3328) for just a few more bucks. Currently listed on GearBest at $36.41. Beelink GT1 was mentioned here several times before and it's dual-band wi-fi, Gigabit ethernet and 2G DDR3 RAM with 16G eMMC, and meanwhile Beelink launched an update with 3GB of RAM DDR4. Currently listed on GearBest for $73.99 (the versio with 3GB of DDR4 RAM). One of the most interesting devices in terms of processing power is the Beelink AP34, which comes with an N3450 processor, 4GB of RAM and 64 GB ROM. The Intel Apollo Lake CPU should profile a little more bang for your buck than most other Win10 devices. Beelink AP34 is available on GearBest at $152 - there are several versions of it. There can't be a promo without at least one Beelink device - they have many interesting Mini PC's with various chipsets. We mentioned before the Beelink SEA I, which is powered by the Realtek RTD1295 and comes with an internal HDD bay (2.5''), two HDMI ports (in and out), USB 2.0 and 3.0, Gigabit Ethernet, dual-band wi-fi with internal antenna. The price is now back at the lowest, currently you can get one for just $84.99.